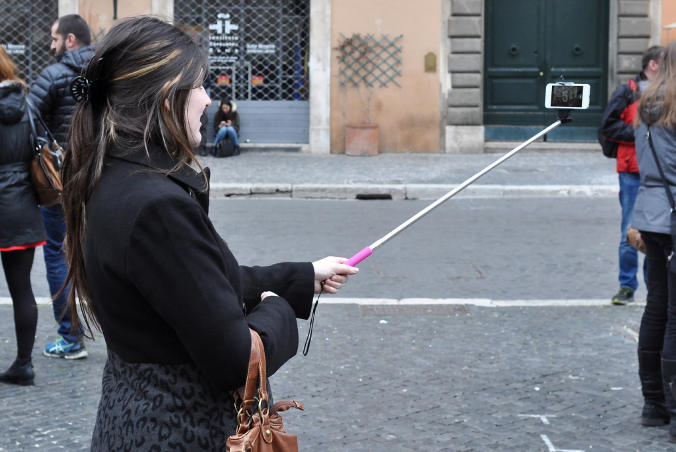 Selfie sticks: Love ‘em or hate ‘em (and boy do some people hate them), they’re becoming a legitimate trend for world travelers and homebodies alike. At no point has this been more apparent than with the recent creation of the selfie spoon, which allows anyone aspiring to Instagram fame to simultaneously showcase their meal and their own face as they consume it. In the spirit of adding selfie capabilities to previously un-selfie-fied objects, we’ve come up with several proposals for selfie sticks that every world traveler shouldn’t have to live without. It’s a selfie stick, it’s a suitcase, it’s the selfie suitcase! This suitcase comes fully equipped with a selfie stick jutting out of its handle. Travelers will be thrilled to document that elusive, dramatic moment when they grasp the suitcase with their travel-ready hands before striding off into the unknown. The premium version includes a home manicure kit to keep users’ hands adequately photogenic come selfie time. Given that some disrespectful tourists have decided it’s totally reasonable to carve their name into the Colosseum or tag graffiti in America’s national parks, it’s about time they had the option to record themselves in the act. The Graffiti Selfie Stick boasts a can of spray paint on the end so users can smile for the camera as they scrawl their names across every historical artifact or natural wonder they encounter on their travels. To facilitate running away from law enforcement, the stick easily collapses into the palm of a hand. Those sleepy Instagram shots from beds in far-off places just got a whole lot easier to execute. The Hotel Bed Selfie Stick consists of a selfie stick sturdily mounted to the headboard of a queen-sized bed that’s ingeniously and generically designed to match most hotel rooms’ décor. Of course, you’ll need to pay extra to check this product, but it’ll be worth it once you arrive at your hotel, hit the sheets, and awake underneath a camera so perfectly positioned that when you smile, the world will see just how happy you are to be on vacation. Whether at a waterpark in Orlando, a themed ride at Disneyland, or a roller coaster in Texas, no trip to an amusement park is complete without adequate photographic documentation. That’s where the Theme Park Selfie Stick comes into play. The stick comes securely mounted to a shoulder harness that can be worn at all times, so you can document your screaming face on a roller coaster just as easily as your satisfied smile after consuming a plateful of fries and cotton candy. Just be sure to follow all selfie stick length requirements on rides. Any solo traveler who’s set out to backpack around the world knows how tough it can be to document the journey without a helpful pal snapping photos. Despair no more, because the Backpack Selfie Stick is here to save the day. The stick comes fully integrated into the top of a backpack that’s just barely small enough to qualify as a carry-on. It’ll document your struggles as you attempt to hoist the overloaded pack into the overhead bin, maneuver it into crowded subway cars, and drag it up the three long flights to your shared room at a hostel (perhaps while quietly cursing your inability to pack light). Ahh, memories! The selfie-in-front-of-a-pretty-skyline is quite possibly the most essential photo in any traveler’s memory box. While obtaining these images is already facilitated by the original selfie stick, the problem is that standard options only showcase a small sliver of what is clearly a skyline worthy of more expansive ogling. Enter the Skyline Selfie Stick. Thirty feet wide and ten feet tall, the stick allows ambitious travelers to capture an image at least 40,000% larger than one taken from a standard selfie stick. Thirty-foot-wide phone sold separately. It’s hard to imagine the travel industry has survived this long without these critical innovations. Here’s hoping someone develops a prototype for these models, stat. And if we left any essential selfie stick innovations out? Let us know on Facebook or Twitter!